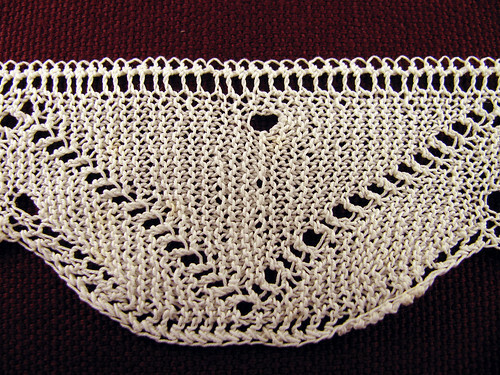 This knitted lace was removed from the tucking of a 1890’s petticoat. The tucking with the lace had been cut and saved from a floor length petticoat. The hemstitching was starting to tear putting stress on the lace. So I painstakingly, stitch by stitch, removed it from the fabric. Whoever sewed it on by hand did not want it to come undone. Every 5th stitch was doubled, in other words two stitches were sewn in the same place. It is a way to make sure if the thread breaks then only a short bit comes undone. 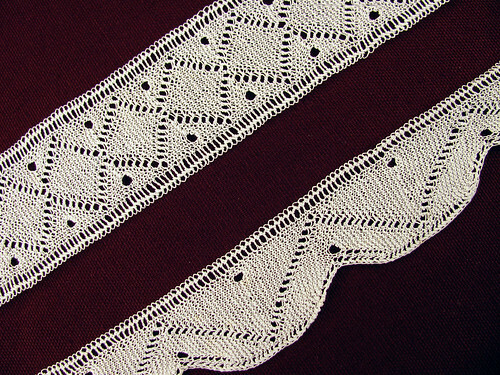 There are about 2 yards of lace in both pieces. I am not sure if they are hand or machine knit. The reason I do not know is that garter stitch is really hard to do on machine, while knitting at such a small gauge would be difficult by hand. I searched on the internet, but couldn’t find any information one way or the other. I think there must be more of this lace still around. I have a complete petticoat with similar trim on it. I’ll post photos of that tomorrow. It is taking way too long to steam press it. I don’t usually mind ironing, but two layers of ruffles are a bit much. 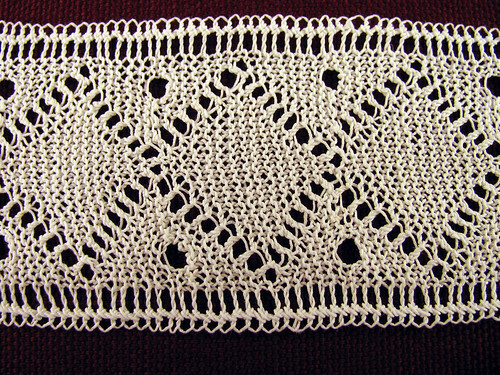 This entry was posted on Sunday, April 5th, 2009 at 3:00 am and is filed under Knitting, Lace and Vintage. Tagged: Knitting, Lace, Vintage. You can feed this entry. You can leave a response, or trackback from your own site.